Kiara Gomez ’14 laughed but was thinking the same thing. Smith looked like a painting from a fairy tale. Her parents had encouraged her ambitions, but they couldn’t help her paint herself into the picture. Gomez’ first few weeks on campus were a blur of “confusion, depression, homesickness, feeling dumb and unprepared,” she says. Her classes seemed far beyond what her high school had prepared her for, plus she had to work night shifts so she could send money home. She managed classes, she admits, “by going without sleep for multiple days at a time and then crashing.” Gomez got through it by staying focused on her goal: a flourishing career that would allow her to help support her extended family. Today, two years after graduating, she is well on her way. She recently completed a Fulbright research grant in Greece, and this fall she will head to the University of Texas at Austin to pursue a doctorate in geosciences and to research climate change. Despite the unique challenges students like Gomez may face, Smith College has made it a priority to reach out to students who are the first in their families to seek a four-year bachelor’s degree. About 17 percent of Smith undergraduates are first-generation college students, a percentage that’s been consistent over the past decade. “These students bring an important kind of diversity to the community, both in and outside the classroom,” says Dean of Admission Debra Shaver, herself a first-gen college student. In recent years, first-gen students have had a higher profile on campus in part because President Kathleen McCartney, herself a first-gen college graduate, has championed the issue. But Smith leaders have long viewed identifying strong first-gen prospects as a moral imperative. “First-generation students are woefully underrepresented in higher education, especially at the highly selective colleges,” Shaver says. The reasons are complex. Some first-gen students come from families or communities where a four-year degree isn’t expected. That sentiment can extend to high school guidance counselors, who may steer students toward work, community college or the college in their town. High schools in low-income communities don’t necessarily have the resources to prepare students adequately for college. And a price tag of more than $60,000 a year for tuition, room and board can seem insurmountable for students—and their families—who may not know how to navigate the complex terrain of financial aid, or understand that it might substantially cover the costs. Of course, first gen does not equal low income. “First-generation students tend to be painted as a monolithic group,” says Tina Wildhagen, assistant professor of sociology at Smith, who is writing a book about first-gen issues. “‘First gen’ becomes a code word for low-income students of color.” But parents of first-gen students may be successful entrepreneurs who never applied to college or who dropped out to pursue careers. Tradespeople who didn’t graduate from four-year colleges can earn higher incomes than college graduates working in the nonprofit sector. 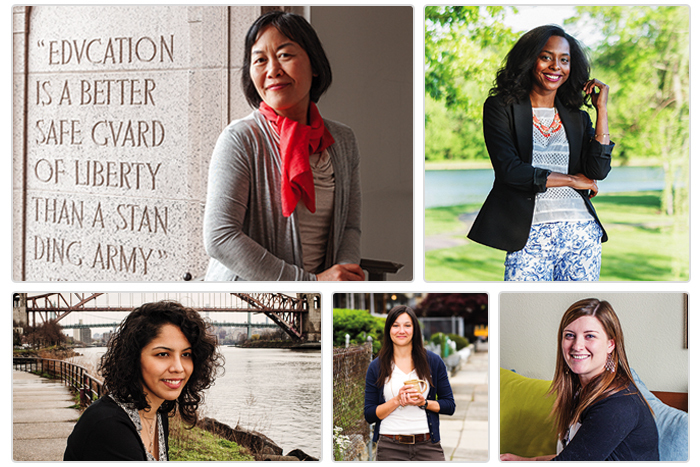 No matter their family origins, first-gen women at Smith perform academically on a par with their classmates. They return for their sophomore year at the same rate as non-first-gen students, and for years their graduation rates have been at or above Smith’s overall four-year graduation rate of roughly 82 percent, Shaver says. That compares very favorably to the national average. According to a 2011 study from UCLA, only 27 percent of first-generation students nationwide graduated from college within four years, compared to 42 percent of students whose parents attended college. Several first-generation alumnae clearly say that while the college has widened their horizons, it’s up to them to capitalize on it and to pass that experience along. Stephanie Gale AC ’13 earned a GED as a teenager and hadn’t envisioned herself at Smith until an employer encouraged her to apply. “Smith is kind of intimidating,” she says. Now she credits the college with teaching her “how to talk professionally with others and develop my leadership skills.” Her years at Smith affected her children, too. “Being in that environment, living on campus, helped my kids understand the importance of education,” she says. Her daughter wants to study engineering at Smith. “Our challenge, as ‘first-gen’ or ‘tenth-gen’ individuals, is to determine how to make the most of the opportunities we are given to improve our lives and the lives of others,” says Eileen Sullivan ’73, a self-described townie whose father worked in construction, including on several projects at Smith. She went on to earn an M.B.A. and was able to retire at 55 from a 30-year career in human resources. Within her career she caught glimpses of what her life might have been like if her immigrant parents hadn’t impressed on her the opportunities they saw for those with college degrees. Sullivan recalls, early in her career, working at a plant that manufactured medical devices in a poor town in New York state. The local high school guidance counselor asked her to speak to students about college and help persuade them not to drop out. “One young woman wanted to quit school at 16, babysit for two years, then begin working at the plant in an unskilled job,” Sullivan says. If Sullivan had grown up in this environment and never attended college, she believes she might have had a similarly narrow world view, in which a career at the local plant seemed the only option. Her high school guidance counselor helped her identify scholarship opportunities, and Sousa won a Fulfillment Fund scholarship to attend Smith. Her degree in computer science was the foundation for her career in software development and management. Now she’s a project manager for an IT consulting company in Boulder, Colorado, and has the freedom to set her own hours and work anywhere she likes. A Smith education—for everyone, but especially for first-gen students—can be a time of great discovery about one’s identity and capabilities. Harlem-born Jewels Rhode ’11, a project manager at the Lineberger Comprehensive Cancer Center at the University of North Carolina at Chapel Hill, recalls gravitating toward people who had backgrounds similar to hers. Joining the Black Students Alliance and participating in the Bridge pre-orientation program for students of color gave her important social support and grounding. Rhode had been in the top 10 percent of her high school class, but at a school she describes as underresourced. Still, first-gen students face distinct challenges. Without the years of hearing parents’ stories about college, first-gen students, especially those from lower-income families, may experience a deep sense of culture shock at elite colleges. Sarah Coburn ’07, a legal aid attorney in Philadelphia, was raised by a single mom whose own mother had a third-grade education. At Smith, Coburn was suddenly surrounded, she says, “by people who were walking in the door with the kinds of cultural capital I was previously unaware of—boarding school educations, professional connections and the like. I attended dinners, paid for by friends’ parents, where the bill exceeded my tuition bill.” She eventually adjusted and developed a strong connection with her adviser, who was also first gen.
Adriana Chalas ’12, of Union City, New Jersey, grew up in a predominantly Latino community where many people lived at or below the poverty line. Following her acceptance to Smith, she was invited to a Women of Distinction weekend geared to admitted students of color to give them a sense of life at Smith in the hope they will enroll. “Just being there felt right,” she says. Still, once she was a student, she found that walking into buildings more beautiful than any she had seen before, enjoying access to a computer lab where the technology was always available and even stopping work for tea on Fridays were all a shock. “Being able to find your voice and get all that confidence that Smith talks about imbuing in their students is hard when you feel the institution itself is at such a higher level,” she says. Chalas felt sure she would leave Smith after her first year. But during winter break at home, she realized she missed the stimulating conversations. “Even though that new experience was so foreign, coming back home was equally foreign in different ways,” she says. “I knew when I was home that Smith was a good thing.” She fared better during second semester, meeting a favorite professor with whom she still keeps in touch. Her first job after college was as an admission counselor at Smith. She remains the only family member with a four-year college degree. “At Smith, I was part of a diverse community. It was at home that I was different. I had different aspirations. I liked doing different things. I talked about different things than they did. Of course that instilled some fear in them, about where I would go, what I would become.” Today Kupp applies insights from her own life in her job as director of the Center for Academic Success at Cayuga Community College in Auburn, New York, where she works with first-gen students. Smith isn’t the answer for all first-gen students who enroll. Jewels Rhode has a few first-gen friends who decided to transfer because they didn’t feel the college served their needs. But when the college fit is good, being at Smith can help first-gen students chart a new, perhaps unexpected course. “An alumna once told me, ‘Once a Smithie, always a Smithie.’ I didn’t realize what this meant until I graduated and realized that Smith will always be with you,” Kiara Gomez says. 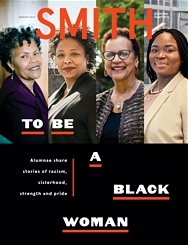 “Powerful actions such as voicing my opinion, questioning why, breaking barriers and stereotypes, and speaking out for what is right would have never been possible had it not been for my Smith education.” Her father eventually came to like and appreciate Smith—especially after hearing from others about its rigor and prestige. Gomez has returned to her high school to encourage students to apply to Smith. The message she brings is one worth carrying to every potential first-generation college student: Yes, you are college-worthy, and yes, it will be hard, but it will transform you. Freelance writer Andrea Cooper ’83 is a frequent contributor to the SAQ.